HAS PINTEREST BEEN ON YOUR TO-DO LIST FOR AWHILE? …and an entrepreneur who keeps hearing about Pinterest for business but doesn’t know what to work on first, and a year later their Pinterest profile only has a few recipes, their latest bathroom remodel ideas, and a pin for that one blog post they did a few months ago? …people who have tons of content to pin all day every day, you’d be wrong. …people who pin 50+ times a day to “hack” the algorithm and pin constantly to group boards, not only would you be wrong, but that’s spammy and totally unnecessary. …people who either have graphic design skills or can hire a graphic designer to create pretty pins, you’re wrong and can spend money on something else you need. What is comes down to is there are no hacks or cookie-cutter strategies to shortcut your way to Pinterest lighting a fire under your marketing gameplan. I KNOW THE REAL REASON YOU HAVEN’T STARTED USING PINTEREST FOR YOUR BUSINESS. You’re working on the latest “shift” in your business plan. You’re wondering how to invest your time and money. But a year goes by…and you’re a little more tired and more frustrated. You have less money to invest in your business…having tried Facebook ads, high-dollar courses, or expensive masterminds. And still you haven’t made much progress - let alone experienced the joy of working less for more money. And it goes onto the to-do list - right next to “clean out the garage” and “scan all my old photos”. So overwhelmed with the day-to-day busywork that you feel like you're drowning in to-do's and spinning your wheels. » Creating great content that isn't getting seen by your ideal customers (or anyone at all). » Throwing spaghetti at the wall with your paid advertising - trying to cut through to noise and hoping for some engagement. You’ve figured out that LIKES do not equal SALES. » Not scaling your business because you have so many ideas you don't know where to start and you have analysis paralysis. » Searching endlessly on Pinterest for how to use Pinterest, only to find blogs and resources that are outdated and no longer useful. YOU NEED YOUR TIME BACK. YOU NEED YOUR SANITY BACK. YOU NEED YOUR MARKETING TO WORK. YOU NEED TO MAKE MONEY. It’d be a fantastic bonus to not have friends and family asking when you’re going to get a real job or assume you watch Netflix all day. They’re not asking anymore because your business is paying your bills, feeding your family, giving you fun money, and you finally feel like a smart CEO. …TIME TO CREATE THE SALES + MARKETING YOUR BUSINESS DESERVES - WITH PINTEREST. Watch this 3 1/2 minute video on my major light bulb moment with using Pinterest for my business - and how it totally changed my mindset and marketing strategy - forever. WHAT IS YOUR LIGHT BULB MOMENT GOING TO BE? BUT WHY IS PINTEREST DIFFERENT? While other social media platforms are designed to keep you on their site - Pinterest is specifically designed to get your audience to click through to your site! Using Pinterest the right way as a business not only are drives website traffic, but you're building the kind of customer relationships that lead to sales and fans of your brand. The right Pinterest strategy lets you stop being a slave to your marketing so you can get back to the business you love. Pinterest PowerUp is very well structured with a thorough step-by-step approach and amazing how-to video content. Cara keeps us in-the-know with Pinterest’s best practices, new rules, and algorithm changes. 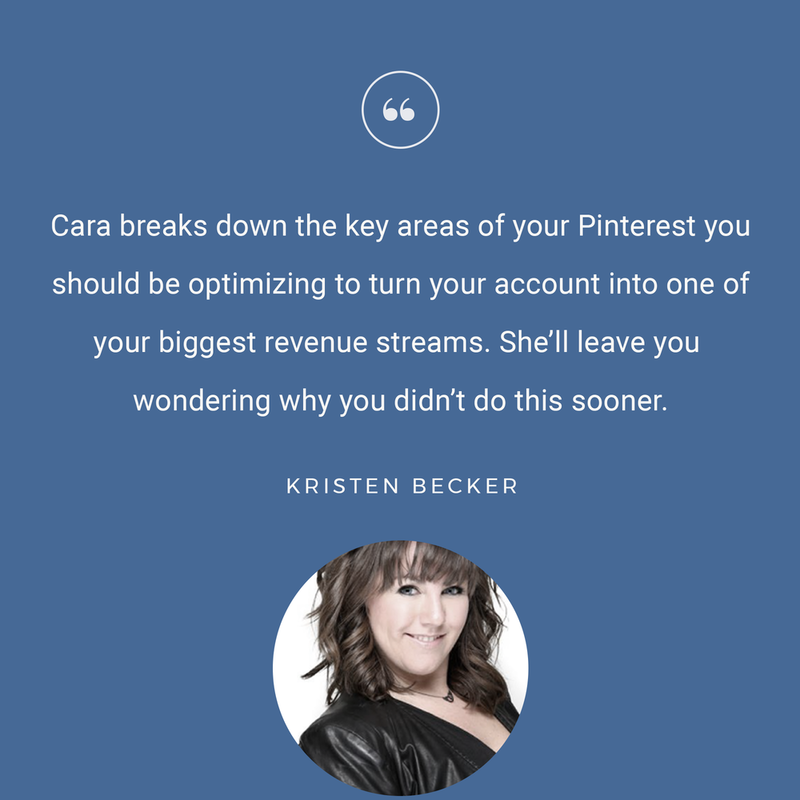 Apart from being authentic, witty, and fun at a personal level, Cara is BRILLIANT at Pinterest... and when I say ‘brilliant’ I mean that she captures the essence of this specific platform and teaches us how to successfully use Pinterest for business ethically and with grace. ALL ENTREPRENEURS REACH THAT TIPPING POINT. You know the one - where you’re so busy with work, your to-do list looks more like a scroll instead of all color-coded out in your perfect planner. You’re good - really good - at what you do, and you’d love to do more of it…if only you didn’t spend half your time trying to be “Insta-worthy” or responding to emails. But you’re scared - scared hiring someone to offload those to-do’s you’re not good at will be unaffordable. Or worse - they’ll be cheap and do an awful job. YOU ARE NOT ABOUT TO “DIY” ANOTHER DAMN THING FOR YOUR BUSINESS. I mean, how many times have you searched for how-to articles to finally wrap your head around how Pinterest is even supposed to work for businesses? You spend several hours reading and printing out that free pdf. You throw up a few boards, pin a few images, and call it a day. You end up like Phoebe over here with her sad little DIY scarf. SO MUCH MORE THAN ANOTHER PINTEREST COURSE. Have you ever been to those seminars where you get a little bit of the information, and then at the end the speaker tells you if you’re really serious, you’ll take out a second mortgage on your house to enroll in their program? Yeah, that feeling. Where you know you just wasted your time and money, you even got a babysitter, but yet you’re still missing out on what the “pros” know. I mean really, do you need another course that’ll collect dust? Lots of Pinterest courses barely scratch the surface of a real Pinterest strategy. Even more teach outdated and incorrect “hacks”. Courses tend to be a “one and done” deal. If you’re lucky the course gets updated occasionally - but when you’re talking about digital marketing, it gets outdated fast. Courses tend leave you feeling like you’re on your own. You might have followed the instructions, but maybe they didn’t really apply to your business goals and resources - super frustrating, I know. Courses can leave you feeling burned out. You might have invested thousands of dollars in a course, and so you think you have to spend way more time an energy than you actually have to “get your money’s worth” - which winds up making you overwhelmed, frustrated, and tired. You are over the “gurus” that only provided super basic stuff and best practices, instead of data-backed plans and next-level strategy. I created Pinterest PowerUp because I saw how Pinterest rocked my traffic and email list like no other marketing "tools and tricks" I had tried...and I tried everything. I discovered what worked and how to build a system around a Pinterest marketing funnel through a lot of trial and error - because I couldn't find any complete training out there or anything that worked for MY business. Creating a membership-based community just made sense. One place to go for the best, most up-to-date information on Pinterest for business. A community of other entrepreneurs doing the same thing. A little hand-holding and a lot of laughs. I WANTED TO TEACH THAT THERE IS SO MUCH MORE TO PINTEREST MARKETING THAN JUST PINTEREST. Hey Rockstar - I'm Cara! I’m a Pinterest Marketing Strategist for Online Entrepreneurs. I started in social media marketing in 2011 by managing 13 million fans across 17 social media accounts for a worldwide band. I won’t tell you the band here, but if you’re into 90’s metal, we should be friends. Since then, I’ve gone on to create hashtag campaigns for cities and their tourism boards, websites for entertainers and small businesses, and provided one-to-one services and support for small business’ digital marketing. A couple of years ago, I had a major ah-ha moment with Pinterest. I knew that I not only loved using the platform personally (read: on the couch at night pinning bathroom remodel ideas), but it was the #1 traffic driver for my own business and my clients. I realized I could take Pinterest marketing to a whole new level if I specialized in the platform and went all in. So I did. I love creating Pinterest strategies that fit into the digital marketing puzzle of your business. For me, it’s about teaching my fellow entrepreneurs how to think critically and create a digital marketing plan - a real, honest to goodness sales funnel - that starts with Pinterest. I want everyone else to feel that sigh of relief that you don’t have to do all the things - you just have to do the right things. HERE’S WHAT WE CAN DO TOGETHER, DIFFERENTLY. PPU the ONLY Pinterest membership community designed to teach, connect, and keep you up-to-date on all things Pinterest while we grow your business. Pinterest PowerUp is about YOU learning what a marketing funnel even is, so you can create one with Pinterest (based on hard data) that builds your email list and gets you sales… so you can get back to your life and what you love doing. We teach you everything from A to Z about using Pinterest for your business, while keeping you excited to keep using Pinterest with community support, feedback, and best practices. Worried you won’t have time for a membership? We break down how much time and effort to invest bit by bit - so you can work it into your schedule and get the most benefit and ROI for your business. You'll come out the other side empowered, inspired, and with a CEO mindset. You'll know exactly how to spend your time and focus with Pinterest to build your website traffic and email list. Everyone starts with this roadmap and step-by-step guide. Yes, there’s lots of other content to consume and learn inside the membership, but I want you to do nothing besides taking purposeful action for 90 days. Why? Because I know if you follow the 90 Days To Pinterest Success Roadmap, you’re going to see big returns and your marketing strategy will start to work. We'll make some quick fixes. If you complete your 90 Days To Pinterest Success Roadmap within the first 90 days of becoming a Pinterest PowerUp Member, you’ll get a video recording of me going through your Pinterest profile for feedback and suggestions (student members are eligible for one; VIP members are eligible for one every quarter). We'll learn how to make it work. We'll go through all the available resources for you to use in your Pinterest marketing funnel - everything from graphics to scheduling. We'll talk about the cost-benefit analysis of when to go ahead and pay for tools and what you can do for free. I'll walk you through how to create branded graphics for your content, using Tailwind, and a few other tips and tricks. We'll work out the kinks. There are things about Pinterest marketing that can be tricky to get setup - like Rich Pins, Conversions Tags, even how to best use Tailwind. You’ll get expert guidance on how to make sure the backend of your marketing funnel is working properly so your audience doesn’t slip through the cracks. Plus, you’ll get lots of direct links to Pinterest’s difficult-to-navigate help guides. We’ll deep-dive into updates + planning. Every 3 months we’ll do a Quarterly Power Session - 3-4 days of content analysis, planning, strategy updates, and one Hot Seat for a lucky VIP Member. VIP Members get to attend the Power Session live, while Student Members get access to all the recordings and handouts once the Power Session is concluded. Every month VIP Members are invited to an informal virtual "coffee date”. We’ll meet online to hangout and chat Pinterest strategy and do some Q+A. This is a great chance to “meet” and brainstorm with each other! Pinterest is an ever-evolving platform! Strategies, best-practices, and new features will change. We will keep you updated with the latest news and Pinterest updates so you're never behind. If it’s newsworthy and affects your Pinterest strategy, I’m going to teach you about it. We'll put more pieces of the puzzle together. There are always tweaks to be done to any online entrepreneur's marketing funnel. Sometimes you have to edit your email marketing, your landing page, your copywriting, and/or your graphics. VIP Members have access to guest expert interviews to give you even more value and information to help with your marketing. We'll give you even more. Besides all the goodness available to Free Rockstar Members, paid members get exclusive access to our private forums and Facebook Group, a discount on 1:1 services with Cara, eligibility for our affiliate program, and more (access may depend on membership tier). AND I KNOW YOU HAVE LOTS OF THINGS YOU LOVE TO DO BESIDES MARKETING YOUR BUSINESS. Pinterest PowerUp is designed to be bite-sized - so even if you only have 20 minutes you can maintain momentum and your learning. We'll follow up lessons with your action-steps so you can easily see how to start designing your Pinterest marketing funnel. Our community is here to support and keep you on track 24/7/365! Get monthly digests about conversations and training to stay up-to-date. Pinterest is something that I know I need to do but had no idea how to go about it. 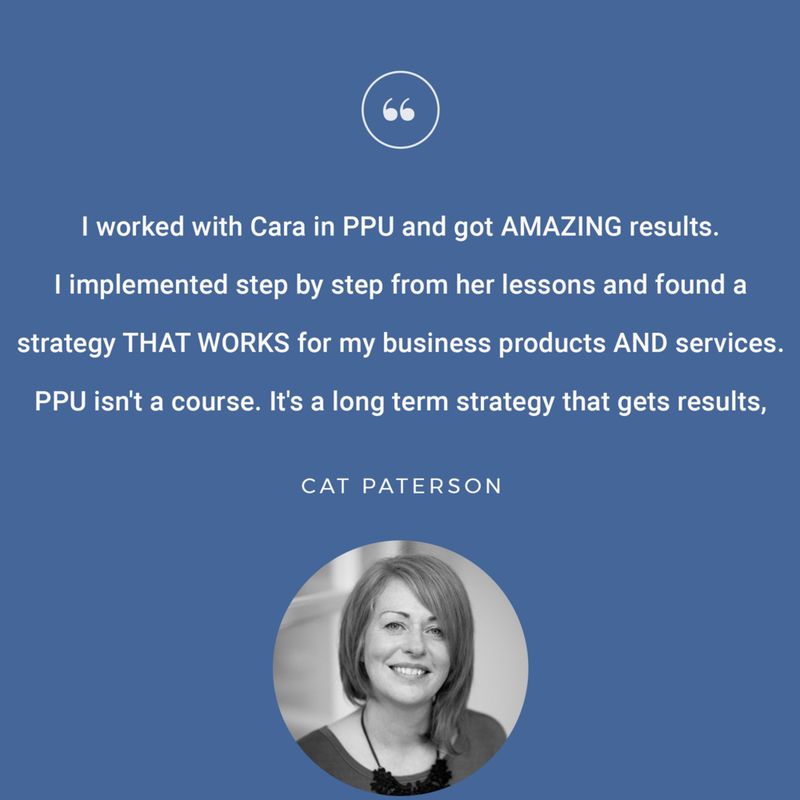 Cara and the Pinterest PowerUP VIP program has been instrumental in me moving forward with doing it the right way from the beginning. NEED HELP ENROLLING OR HAVE QUESTIONS? JOIN US FOR 30 DAYS! I back up everything I'm offering to you 100%, so I'm going to take on all the risk! If you fully participate in Pinterest PowerUp and you're not 100% happy, then you may request a refund within 30 days of enrolling. Need to cancel or change your membership level? Super easy - 2 clicks and you’re done. 1. Completing the first 30 days of the Pinterest Success Roadmap. 2. Completing all action steps within 30 days of the Pinterest Success Roadmap. 3. Attending and participating in the private Facebook Group and Forums. If you're not completely happy with the training, contact me directly (hello@carachace.com) with your homework, within the first 30 days, and we'll refund your money. IMPORTANT NOTE: We require your completed homework/action steps from the first 30 days of the Pinterest Success Roadmap before we'll issue a refund. Why? Because we know if you do the work, you'll get results. If you do the work and don't get value, then we've not done our job! My Part: I'll issue you the refund. It's a big risk for me, but I'm so committed to your Pinterest success that I'll do everything I can to help you overcome any obstacles that are keeping you from moving forward with a Pinterest strategy that will get you traffic and emails. STILL ON THE FENCE? GOT QUESTIONS? What if I'm overwhelmed with ideas to grow my business and I don't know where to start? First of all - congrats! You know your business is ready to grow and that's no small thing. Feeling overwhelmed is actually a sign that you’re looking for answers. It means you’ve been doing the work, testing your ideas, learning what you can get your hands on, and learning lessons about being an entrepreneur. Now, you’ve got to remember that what got you here won’t get you there. If you’re finding yourself overwhelmed and unsure of how to make your marketing really work for you with MORE EASE and less stress, it’s time for a change. Your job isn’t to keep doing more - more hours, more tasks, more social media - it’s to do less with more focus. When you join Pinterest PowerUp, we walk you through a proven process to build your Pinterest marketing foundation to be streamlined, consistent, and predictable. It's easy, effective, and foolproof! I haven't really even started with Pinterest. Should I join Pinterest PowerUp first? What a great place to be! Building a Pinterest profile with a strong foundation from the get-go is often easier than trying to back-track and fix mistakes. You know the phrase, “Do it right the first time”?? That totally applies here and it’s yours to take advantage of. Just by checking out Pinterest PowerUp, it’s clear you’re a smartypants that knows the fastest way to get results is to get the support and training you need to shortcut the process. With Pinterest PowerUp, you learn the proven system to flip your website traffic and email opt-in funnel to “autopilot” - with minimal checking in to make sure all systems are go. You don’t need to have thousands of Pinterest followers or be on tons of group boards. You need Pinterest, your website, and an email program. That’s it. Through the Pinterest PowerUp learning process, we’re going to focus on what works best for you so you can work SMARTER and shorten that learning curve. You won’t have to figure this out alone. It's as simple as following the steps and tapping into our community for feedback and support! Should I join the Basic or VIP membership level? If you're a self-starter that just wants to get all the info you need to get it done, you're probably good with the Basic membership. If you are the kind of entrepreneur who loves community support, meeting new peers, and wants a good amount of time with me for personal hand-holding, the VIP membership is your best bet. Let me first say this - Pinterest PowerUp is NOT a get rich quick, six-figure launch in 30 days kind of program. There is no magic pixie dust for building a sustainable, working marketing funnel! You could see a jump in traffic and emails in weeks, if you get laser focused on learning and taking action on the Pinterest PowerUp strategy. You could have the results I did - dramatically increasing your email list by simply identifying your traffic-driving content and tweaking it to this system. However, most students can expect to see results in the 4-6 months following Pinterest PowerUp, especially for those in the startup stage or taking their business in a new direction. The keys to big results with Pinterest PowerUp is putting it into action and being consistent. When you’re an entrepreneur, the faster you can pivot, make decisions, and implement, the faster you are going to get to the other side of seeing results. One of the best things about Pinterest is it’s a long-game marketing strategy. Like the blog story I told you a couple of days ago, Pinterest can drive traffic and get you email subscribers YEARS after you publish a piece of content. In short - you don’t need a quick fix. You need a clear, easy marketing growth strategy and action plan. How is Pinterest PowerUp different than other Pinterest courses out there? I am not the first person to offer a Pinterest training course, and I will not be the last. What I CAN tell you, is that Pinterest PowerUp is the ONLY PINTEREST MEMBERSHIP COMMUNITY out there, and it's the most comprehensive, complete training on Pinterest I have seen offered. So many courses get outdated almost overnight. It's so frustrating to invest in a course, and have it not stay up to date with current best practices. It's even more frustrating when the course if full of "hacks" and questionable techniques to game the Pinterest alogrithm - almost guaranteeing you'll fail or get your account shut down. Pinterest PowerUp is constantly updated with the latest best practices, platform changes, and news. The tricky stuff like setting up Rich Pins and Conversion Tags. How to use both Pinterest Analytics and Google Analytics to know what's working. Workflows and strategies for pinning and re-pinning. Graphic design for your pins. Email marketing for your Pinterest audience. All about Tailwind, SmartLoop, and Tribes. How to get started with Promoted Pins. Inside Pinterest PowerUp, our focus is making sure you have ALL the pieces of the marketing puzzle required to make Pinterest work for you and your business. This means going beyond Pinterest, into how it works with all other aspects of your business - like content strategy and email marketing. You’ll create a plug and play system you can use over and over again once the strategy is built. I know this will turn off the people looking for that magic pixie dust easy-button. Because I’m here to serve and support entrepreneurs like YOU. The take-charge bosses who are ready to create a marketing funnel that grows their business - with proven systems that are clear and easy to do - to get you results. Finally, Pinterest PowerUp is different because I’ve added so much additional support to make sure you are getting what YOU need for your business. Pinterest PowerUp is a complete, updated training AND the guidance and support you need! Do I really have time for Pinterest PowerUp? For entrepreneurs especially - almost nothing is more valuable than your time. You need a clear, easy marketing strategy to increase your return on investment with your time. Is your desire for growth and ease more important than the rut of being in the day-to-day of your business? You have to make a shift. Pinterest PowerUp was created with 1 goal in mind: TAKING ACTION. Each training in Pinterest PowerUp is broken into smaller lessons you can take step-by-step to continue your momentum and implement this system. When you enroll in Pinterest PowerUp, you’ll be guided by a 90 Day Pinterest Success Roadmap so you know exactly how to spend your time. The roadmap is easy, effective, and foolproof. Every entrepreneur and business is different, but you can expect to complete the 90 Day Pinterest Success Roadmap and implement this system in about 90 days if you spend an hour or so a week doing the work and taking action. The simple truth is - the more you put IN to Pinterest PowerUp, the more you’ll get OUT of it! If you're really gung-ho about making Pinterest work for you, you can set aside 2-3 hours per week and see results quicker. It’s a small time investment when you realize you’ll be setting up a system that can more than increase your email list more than two-fold in a year. And I mean really, you know the last time you sat down to watch Netflix you looked up and it was 2-3 hours later. Soooo...yeah. Can you remind me what we'll cover inside Pinterest PowerUp? You’ll learn how to use Pinterest strategically as a business (not just for recipes and home decor). You’ll set up Pinterest and your website to talk to each other so you know what content is driving the most traffic. You’ll create your own branded Pin templates (or use the done-for-you templates I’ve included) so you gain the brand recognition you deserve. You'll learn how to use Tailwind to take your re-pinning strategy to a whole new level. You’ll create a pinning and re-pinning strategy that keeps your profile fresh and new eyes on your content. You’ll systemize the workflow between Pinterest, your website, and your email list. You’ll learn how to take advantage of Tailwind Tribes, SmartLoop and product pins. You’ll learn how to create, manage, and analyze Promoted Pin campaigns and understand conversion tracking. Plus you’ll get templates, swipe files, action sheets, and checklists to make it even easier to put this all together! Do I get personal support and access to Cara? YES! I want to really get to know YOU and your business (in fact, one of your first steps when you enroll is to fill out a questionnaire so I can start learning about you and your business). Your business, your experience, your voice, is uniquely you - and I know that I can help you apply what you’re going to learn in Pinterest PowerUp to fit you and your business. Lots of business owners get stuck because they don't know how to apply general strategies to their specific business. I got you - that extra guidance and brainstorming is my favorite thing to do with our members. I can't wait to see the lightbulb turn on for you when you realize what a game-changer Pinterest is going to be for you, and how exactly to use it. VIP Members get lots of personal support, including monthly virtual coffee dates, quarterly feedback sessions, and eligibility for Hot Seats. When you show up in our online community and our Quarterly Power Sessions, you can be sure you’ll get focused coaching and the answers you need. Our VIPs essentially get the benefit of being part of a small group mastermind. Basic Members get to jump on Zoom with me when they enroll to figure out exactly what their next steps are and the gameplan for their business. Bottom line is this: If you been looking for the best way to grow your website traffic and email list, but you want more support and a mentor and community to cheer you on, Pinterest PowerUp could be a perfect fit for you. I know that the #1 reason most entrepreneurs struggle to take action is they lack access to knowledge AND support. That’s why Pinterest PowerUp was built around proven steps and a personal community ready to help you realize your GREATEST potential as a super smart CEO. Is it really risk free? I don’t want you to be left with the bill unless Pinterest PowerUp is your next step towards a marketing funnel that grows your business. That is why I’m giving you a FULL 30 DAYS to put Pinterest PowerUp into action before making the final commitment. If you do the work outlined in the first 60 days of the 90 Day Pinterest Success Roadmap and are not happy with the results, just let us know and we’ll refund your investment. That would make us very sad but we know that’s the nature of membership programs. If you pay monthly, you can cancel at anytime. If you pay yearly, you will have received a discount to pay for the year up front. You may cancel and receive a refund at the non-discounted rate. It's two clicks and super easy. What about upgrading or downgrading my membership? You'll probably realize you want in to the VIP membership after checking us out. It's only a couple clicks to upgrade (or downgrade). You can upgrade to annual membership any time with a couple of clicks from your account page. Our system will automatically take into account the time left on your current subscription, so you'll never be double charged either. Will I still have access to the materials if I cancel? No. Your membership entitles you to enter the members area and access the content there released prior and during the duration of your membership. If you cancel or do not renew your membership you will no longer be able to access the content inside Pinterest PowerUp. I still have questions, Cara. Can I reach out? Absolutely! I want you to feel confident in your decision to join us. Email me at hello@carachace.com and ask away! ARE YOU READY FOR PINTEREST POWERUP? You’re DONE with creating tons of great content and having no one see it - and you’re ready to create an easy system that runs almost on autopilot to get fresh eyes on your website and potential customers on your email list. You’re committed to creating a better way to have your business work FOR YOU. You will create the results that come from having a system around your online marketing that works with EASE. You are tired of HOPING your marketing + Facebook Ads will work - and you're done with throwing spaghetti at the walls as a strategy. When you focus your CEO mindset on the action steps I’ll walk you through, you'll design your path to tipping the scale in your business in months - not years. You are ready to know exactly what, when, and how to use Pinterest marketing to build your paying customer base. It’s so empowering when you KNOW you’ve found another piece of the marketing puzzle that is going to make a dramatic difference in your business. You are ready to come to the table with your CEO mindset and get to work. Designing a marketing strategy that's a well-oiled machine will take work upfront so you can have ease later. That's why I'm here to guide you through proven strategies so you can get to that ease even quicker. You spend 3-5 hours a month working on your Pinterest marketing. Your website gets more and more traffic - but instead of just empty numbers - you are building relationships with the right audience. You finally have a steady income that let’s you invest in other things for your business - like a bookkeeper or virtual assistant. You get a full night’s sleep instead of wee-hours hustling (unless you have children - then you’re on your own). Instead of wasting time at awkward networking events, you can stay in your comfy clothes and chill at home. You have the time and money to, oh I don’t know, actually do that bathroom remodel or learn how to knit a scarf. You know - those things you’ve been pinning on Pinterest for yourself.